My Fiancee always quarrels with me that I don't spend time with her and have no care for her in my heart which is not true. In the last week, There was her 22 birthday and I was very well aware of it but I remain silent and showed that I forget about her birthday. At the evening. I called her after reaching at her home on her favorite black Corolla and take her with me. I arranged a really beautiful candle light dinner for my Love Alyzia which you people can see in the above photo. I closed her eyes and everything was just ready. 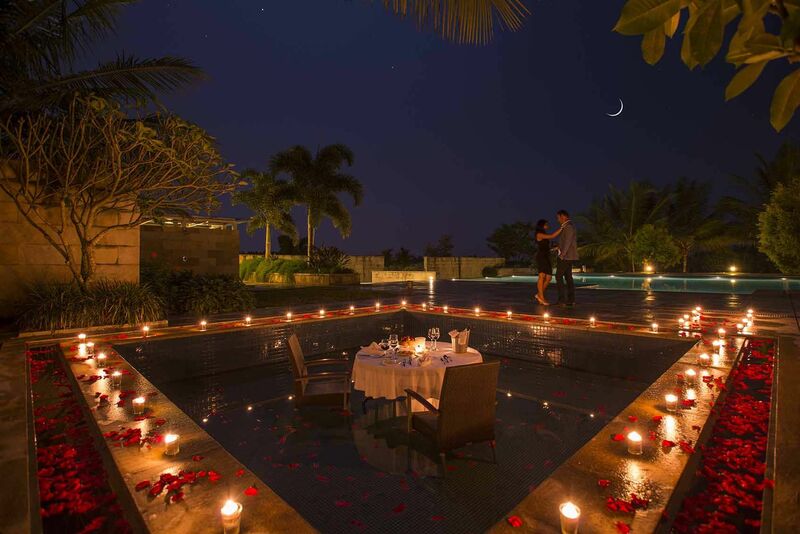 When I opened her eyes than she was seriously so much excited to see because I arranged the candle light dinner for her in the swimming pool. There were flowers all around spread here and there. The candles were lightening. The smell of flowers could be felt as well as the music was playing in the background. That was a bright night as the rays of the moon was all around and the stars of the sky were watching all this. Then I wished her a very happy birthday and she was so much happy to see all of these things as she came to know that I really love her and did all of these arrangements only to make my love happy. We also enjoyed dancing at that time. I gifted her a beautiful diamond ring as well as a birthday gift and she was having a beautiful smile on her face and a shine in her eyes. Her compliment was more effective and heart touching for me when she said it was the ever best birthday of my life and I want my all birthdays special like this. What a great memory. I was involved in reading and seems to me all that things were in front of me. She is so lucky to have intense lovely feelings for her. Really a great way you choose to show your love. Impressive. Aloysius, I just love to say that you made really great and romantic arrangements for youir sweatheart to make her happy as well as made her birthday precious for her. She is so lucky to have a lover like you in her life. I am hopeful both of you will spend a great time in future life. Really appericiatv and an ideal way to show your feelings for her. I can assume she will be really happy after watching this. Aloysius!! I will love to say that this is something sounds so special to me. I can assume how much happy she would be while enjyong all of these things. i am so sure that this is gonna be a great way of fun for sure. it will be so much ncie and worth seeing things ahead. i hope i will also have something like that soon. Brinkman, I am agree with you and love to say I really wanna get this sort of surprise from my close friend. She always remains busy in her study and office work. I hate this thing when she ignores me. I will like to share this with her soon and hope so after reading this she will like to arrange something like this for me. Do you know about travel deals from los angeles? Wow, Aloysius! You ahve aranged all the things in well manners. Your shared image shows that which kind of beautiful arrangemnts you have done for her. After all of these things every gril much be happy and like iot In fcat, after redaking yhour post, Iam also planning to go something like this for my finacee. ANDY, I am going to do agree with you here that Aloysius has done all thing in such a perfect way as everything is looking lovely and reflect her love for her sweetheart, I think it will be a great surprise for a girl if his love will do something like this for her with his hands. She will definitely be a luckiest and happiest girl in the world. Hope someone will do something romantic like this for me in future too. Anyways, i wish you could find someone who will fulfill your wishes and will make you happy a lot. So best of luck and keep finding a buddy. Max William, Well, Yes, I really need someone who will do such kind of things for me. You know what I am engaged since the last year but my fiance is so boring. He always remains busy in his office and couldn't extract some time for me. He just loves his work which is seriously irritating for me sometimes. I will surely share the above post with him and hope he will understand and plan something great like this for me. yeah, there are some expectations behind this thing and I am so sure that he will understand for sure and will manage some time for you as well. So just try to have some fun there and that is gonna be outstanding for sure. Just try to realize him that he is important for you and you like to spend your time with him. and without him your life is colorless and boring.